Trinity College Dublin, near the General Register Office (and rather prettier!). The first task at GROI was to cross check a large list of claimed Irish Kennedy marriages I had brought with me. Generally these are couples who moved to Scotland and on the birth certificates of their children, had to state where and when they married. I only checked those which were easy to verify in the indexes, which cover Protestant marriages from 1845 and all marriages from 1864; volumes after 1995 are held behind the counter so I skipped checking those to save time. Eventually I managed to check 88 marriages of which I located 35. A few of the others lacked full spouse data so couldn't be confirmed. There are a multitude of reasons for the absence of the rest. For some the spouse's surname may have been mis-transcribed or the date or place mis-stated. In other cases of course, the couple may not actually have been married. As this was a bulk exercise I only checked the year stated, or sometimes the next year if it was a December event. Based on Scottish data it is surprising how often fathers in particular either can't recall or don't wish to recall the correct year of their marriage! Of this batch of marriages the bulk lay in Ulster as more Kennedys came to Scotland from there than from the south, the top registration district being Ballymena, Co. Antrim with 6 confirmed marriages. Most were in the historic province of Ulster with 2 from Dublin and 1 each from Cavan, Kildare and Tipperary. 2. Next step was a transcription and analysis of early BMD events from the civil registers. In the opening year of 1864 the figures were as follows - all refer to 'Kennedy' alone unless stated otherwise (the spelling O'Kennedy is usually almost entirely absent). Although the tendency is to prefer births as a measure to analyse and plot, I instead opted to record the marriages and deaths. In particular deaths offer a pointer to where elderly relic populations lived, where families have either died or daughtered out or migrated to the cities. The 1864 marriages including spelling variants were added to the project database, along with a master checklist of all the Irish registration districts and their corresponding counties for validation. The top three registration districts for marriages were Dublin North, Dingle and Nenagh. The Dingle cluster so far is looking to be fairly locally concentrated suggesting a recent migration out of Tipperary - the intermediate districts of Tralee and Listowel have low Kennedy numbers. However, this cluster was present in the 1659 census so it must have just stayed localised. A century later, Kennedy numbers in Ireland were much reduced, partly of course because of the loss of six counties which in the case of Antrim and Down in particular had large Kennedy populations. From 269 marriages in 1864 there were only 132 in 1964, plus two O'Kennedys. Two years later in 1966 the registration information was expanded to capture exact date and spouse name in the index, however I opted to study the 1964 marriages by registration district as a comparison. By 1964 the effects of urbanisation have finally weakened the dominance of Dingle, with big numbers especially in Dublin North and South, and the largely rural district of Nenagh still showing strongly in third place. The next dataset I looked at was the 1864 Kennedy deaths. Name variants were more in evidence: O'Kennedy (1), Kenaday (1), Kenedy (42), Kenneday (2) and Kenneddy (3). The oldest male Kennedy death on view was a John Kennedy who died aged 98 and for females a Margaret Kennedy at 95. The top ranked districts for deaths were Dublin South, Nenagh and Dublin North, followed by Belfast, Thurles and Cashel. So 3 of the top 6 districts were a contiguous arc of districts in Co. Tipperary, although Borrisokane, the other north Tipperary district, was some way down the list. This time Dingle was a little off the top in 13th place. As a result, 1864 is now head and shoulders above all other years for BMD data in the project database with over 1000 Kennedy events! From Dublin I took the coach to Nenagh and checked in to a local hotel. I visited two small cemeteries in the town, one at the Franciscan friary (founded by the O'Kennedys) and one by the railway station, and photographed a small number of Kennedy gravestones. At the church there is a large tomb for a famous local man, the Very Reverend Canon William O'Kennedy (see photo on News page), who was born just outside the town and died at St Flannans College in Ennis, Co. Clare, of which he was President. Plans to visit Silvermines and Killaloe were shelved in favour of two separate trips to Limerick city. 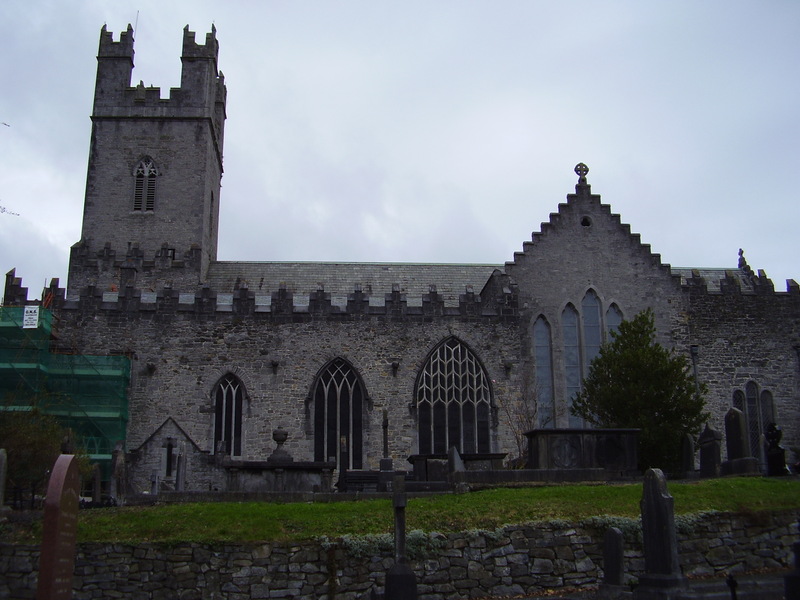 In the first I visited the old medieval cathedral of St Marys, founded in 1168 by Domhnall Mor O'Brien and its graveyard but no Kennedys were in evidence there (it became Church of Ireland during its long history so this was maybe no surprise). On the second trip I walked south from the bus station to Mount St Laurence civil cemetery where I explored and photographed a number of Kennedy graves (18 in all).